In my opinion, the release of .NET 3.5 and LINQ to Objects was one of the greatest productivity and safety enhancements to .NET since its inception. It enabled the concise expression of highly generic algorithms depending solely on the simple notion of an iterable stream, IEnumerable<T>. You could then specify semantics for duplicates, ordering, and grouping constraints over streams with a nice query syntax or a simple first-class function syntax. The advent of extension methods allowed such extensions to be packaged into a neat, consistent framework under System.Linq.Enumerable. Sasa.Linq.Enumerables extends the functionality for IEnumerable<T> even further. Basically, the 'diff' stream in the above sample describes the changes you have to make to 'first' in order to transform it into the stream 'second'. This is fully described by the output which specifies a subtraction at position 1 of the value 99, an addition at position 1 of values 99 and 8, and the addition of two values at position 5 of 66 and 234. Except the C# compiler won't have to create so many delegates in all the various assemblies that flatten sequences. The generator function returns an Option<T>, so terminating the generator requires simply returning Option<T>.None. Note that this method will handle jagged sequences, but transposing twice will not necessarily recover the same sequence as the original input. All the jagged entries will be pushed to the last row. There is a zip overload for each of Sasa's tuple types, so you can zip up to 4 streams together. Like the Enumerables.Zip extension, ZipWith is defined for zipping up to 4 streams. Streams are a pervasive component of .NET I/O, but the standard stream interface is missing a few convenient extensions, if only needed for testing and debugging purposes. Sasa.IO.Streams provides a few simple extension methods to simplify working with streams. There is also an overload explicitly specifying the number of bytes to copy. One persistent difficulty in dealing with IO in .NET is path handling. .NET exposes a platform's directory separator characters, but really this sort of thing should be automated. Furthermore, paths are considered simple strings and so concatenating fragments could leave you with a path string that goes up and down directories with no clear final result, ie. resolving the final path string is left to the OS. This means that you can't easily reason about the constructed paths without consulting the OS, which is a relatively expensive operation. Furthermore, Path.Combine has a number of corner cases that make constructing paths non-compositional, requiring numerous argument validations to ensure a correct result. Enter Sasa.IO.FilePath. It's a simple struct that encapsulates an underlying path string, so FilePath operations are just as efficient as your current path handling. FilePath fully resolves directory change operations where possible, so the final path string designates the path the OS will actually look up. Null or empty strings are considered references to the current directory, ie. ".". There is also a "jail" operation which ensures that a provided path cannot escape a particular sub-directory, just like the OS-level chroot jail. I first posted about this abstraction back in 2009, but the name and implementation has changed a little since then. IEnumerable<string>: the sequence of path components making up a full path. When writing generic code, it's pretty common to yearn for some generic arithmetic interface so you don't have to copy-paste the same function over and over to provide overloads for all the CLR's numeric types. Omitting a standard arithmetic interface was one of .NET's biggest mistakes in my opinion. Enter Sasa.Operators<T>, Sasa.Operators<T0, T1>, and Sasa.Operators<T0, T1, T2>, which are static classes that expose delegates for all operators on any given types T, T0, T1, and T2. T must contain operator overloads for the corresponding operation to be available, or if T is a primitive type like Int32 or Double, then a delegate is dynamically generated and cached. If T does not contain operator overloads for a given operation, the corresponding delegate for that operation will be null, so you just need to check for their presence as a precondition. Sasa.Operators<T> provides operators over a single generic type T. In other words, any operators defined only on a single type T will be available via this generic static class, eg. addition, subtraction, multiplication, etc. Not all operators are defined over only a single type, some are defined over two types. Sasa.Operators<T0, T1> provides efficient access to such operators, like explicit or implicit casting from a type T0 to T1. Sasa.Operators<T0, T1, T2> is the granddaddy of the operators classes, as it exposes the full generality of binary operators over 3 possible type parameters. In other words, it's possible to define an addition operator that takes a T0 and a T1 and returns a T2. Unary operators can only have two possible type parameters, so they are only available via Sasa.Operators< T0, T1>. I've briefly discussed Sasa.Dynamics in my first announcement for the upcoming Sasa v0.9.4 release. There was some confusion about what Sasa.Dynamics really is though, since the post didn't go into much detail, or wasn't explained clearly enough. In short, Sasa.Dynamics is a framework for type-safe, blazingly fast reflection. You can clearly see that Type<T>.Copy is sometimes many orders of magnitude faster than a roundtrip through BinaryFormatter. The benchmarks for immutable types will be particularly fast, as you can see from entries for String and Int32. This is because immutability of a type is automatically detected (via Type<T>.MaybeMutable), and such values are never copied, just returned as-is. Of course, it's not exactly hard to beat framework serialization, but what's notable here is that I'm doing it with fully general reflection and very little optimization effort. The more type information you can provide to Type<T>, the faster it is. For instance, there's a 3x-5x difference in Int32 and String copying when we provide the statically known type T rather than object. I've also barely scratched the surface of the optimizations that can be done. The structural induction inherent to Sasa.Dynamics means I can also easily build a trace of the operations performed for a given type T, generate a function to do it all in one step, and cache that somewhere for when I need to rerun it. Basically, it would be a small tracing JIT for any reflection-based operation. There are still a few cases I haven't fully optimized for deep copies, but it seems to work pretty well so far. Sasa's binary serializer is also based on Sasa.Dynamics, but that hasn't received any review or optimization effort, so while it passes many correctness tests, the performance isn't all that great. Still, if you're interested to see what a serializer based on structural induction looks like, it's a good reference. Embroiled in a few projects right now, but one gave me the chance to explore Microsoft's code contracts a little. I was initially excited about the prospect of contracts when they were first announced, hence my crude API-compatible implementation in Sasa.Contracts which allowed me to prepare my codebases for contracts. I've now had a chance to play with the real thing, so we'll see how it holds up to reality. We have here a simple class that wraps a nullable reference type. 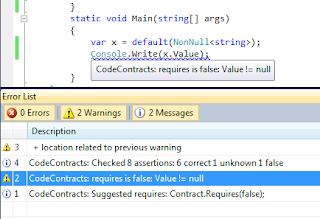 The preconditions specified on the constructor ensure that no NonNull instance can be created with an explicit null value. The only remaining possibility is to create a value via default(NonNull<T>), so contracts haven't bought us much there. However, check out the precondition on the NonNull.Value property: before you can call the property, you have to ensure the property is itself not null. This ensures that only values of NonNull created via the provided constructor can use any value of NonNull! Mission accomplished! Through some clever application of preconditions, you can probably ensure all sorts of behavioural properties on objects you couldn't verify before, so this is fertile ground for experimentation and optimization. There's always a downside of course, and in this case it's the long contract check times. 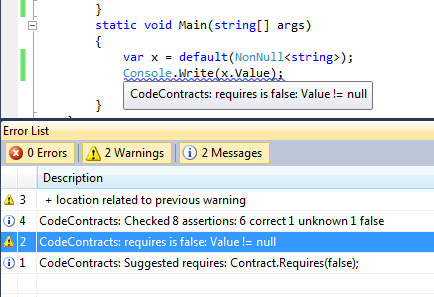 Visual Studio has an option to check contracts in the background after a build completes, which helps a little. Also, there are a few limitations and bugs remaining in the MS's static checker. For instance, according to the docs, invariants declared on structs are supposedly ignored (section 6.6.1), but I discovered this isn't completely true (Microsoft Connect bug reported). I also found another bug while testing the interface contracts, so caveat emptor! Still, it's a promising framework and I plan to make use of it where I can to improve the reliability of my code. Sasa v0.9.4 will probably be the last release for .NET 3.5, so subsequent releases will exploit contracts as much as possible. In particular, Sasa.NonNull<T> will finally get a static analysis to ensure that property is respected! Base64 encodings are built into .NET, but the standard Base64 encoding is not safe to use in URLs. Sasa.Web.Url64 provides methods to convert to and from a URL-safe Base64 representation I refer to as Url64. It's well-known by now that the CLR's event model is a little broken. It requires clients using events to handle corner cases that should be handled by the runtime, particularly thread-safe event mutation and null-safe event invocation. Eric Lippert describes the issues. Sasa.Events is a static class providing methods achieving just that. It makes mutating events/delegates thread-safe (#1 thread-safety from Eric's article), and makes invocation null-safe. I often use something like the above for thread-safe, lock-free disposal patterns. I could certainly be persuaded to add more overloads for other cases, so if you want some added, speak up! I covered some of Sasa's core interfaces previously, but I shall provide a more thorough treatment here. This demonstrates the use of a simple immutable value class, but the Value property need not be so simple. It can even throw exceptions in some cases. For instance, as covered in a previous article Sasa.Result<T>.Value throws InvalidOperationException if the result was an error instead of a value. Sasa.IOptional<T> is an interface that implements IVolatile<T>, IResolvable<T>, and IValue<T>. It is implemented by many of the abstractions in Sasa that encapsulate values, like Sasa.Option<T> and Sasa.Result<T>. This interface is implemented by Sasa.Result<T> and a few other abstractions in Sasa. Sasa.Result also implements the LINQ query pattern on IResult<T> instances. It's common to return multiple values from functions, and there are two common ways to do so in .NET: out parameters, and ordinary objects like structs and classes. Unfortunately, defining a whole class just to return two or three values is often overkill. Also, out parameters have some limitations, like inability to use them in lambdas, even when it's safe to do so. Enter tuples, which are types containing only generic parameters whose only purpose is to group some items together to address these difficulties. Sasa's ITuple interfaces [1, 2, 3, 4] define the abstract contracts satisfied by Sasa's tuple types. However, unlike .NET's newly released tuples, Sasa's implementation tuples don't use the "tuple" name. They are instead split into Pair, Triple, and Quad because I found the shared "tuple" name often confusing when auditing code. Particularly where nested generics are concerned, like enumerable sequences of tuples, it's often hard to distinguish Tuple<string,int,int> from Tuple<string,int,int,int> while refactoring. This property is implemented by Pair, Triple and Quad. This property is implemented by Triple and Quad. This property is implemented by Quad. All of the tuple implementations implement equality, GetHashCode, and comparison overloads accounting for each encapsulated element. The tuples are also explicitly defined as fully immutable via the readonly qualifier on their fields. This means that Sasa.Dynamics.Types.MaybeMutable will return false if every generic argument is similarly immutable. I stopped at Quad<T0, T1, T2, T3> because beyond four values you should probably be creating a specific class to encapsulate the return values, or defining your function to take a callback that creates the specific type you want, ie. in the same fashion as SelectMany. /// Computes the minimum spanning tree. /// edges describing the minimum spanning tree. An Edge is a simple class that encapsulates two vertex numbers and a weight represented by a double. It's also IComparable, so we can sort on it using the weight. Prim's algorithm selects the minimum weighted edge between a vertex we have not yet accepted, and a vertex that we have accepted. We use a bit array to track the vertex numbers we've accepted, and simply search weight-sorted edge list for the first entry where one vertex is accepted, and the other is not. This is an O(V2), where V is the number of vertices. We could also contract the list after each accepted edge, but that doesn't change the overall time complexity. I've included these implementations in Sasa.Numerics.dll for the v0.9.4 release.